Born in Charlotte, North Carolina on July 2, 1942, Richard graduated from the University of North Carolina at Chapel Hill in in 1964. He attended the George Washington University School of Law where he received his Juris Doctor in 1967 and his L.L.M in 1969. 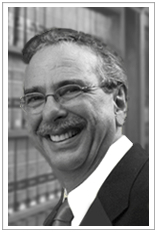 He served as a trial attorney at the Federal Trade Commission and as a prosecutor for the Office of Corporation Counsel in the District of Columbia until 1972, when he joined The Law Offices Samuel Greenbaum, as a bankruptcy specialist. Mr. Gins has served on the Committee on Bankruptcy of the District of Columbia Bar, and he served as Chairman of the bankruptcy section of the Montgomery County Bar in 1983 and 1984. He has been a member of the American Bar Association, the Bankruptcy Bar of Maryland, the Montgomery County Bar Association and the Walter Chandler American Inn of Courts. He was admitted to the bar in the District of Columbia (1968), Maryland (1971) and the United States Court of Appeal for the Fourth Circuit (1979). He has received the highest rating of AV by Martindale and Hubbell, been acknowledged as a “Super Lawyer” for a number of years by certain publications and was selected as one of “The Best Lawyers In America” in the field of bankruptcy.